The Kansas City Royals have been an exercise in futility for the past two decades. In fact, the only thing separating them from being in the exact same category as the Pittsburgh Pirates is their 83 win season in 2003. And that season was in the middle of a stretch from 2002-2006 where the lost 100 or more games in four of those five seasons. The last four seasons however have seen the Monarchs Royals increase their win total from 65 in 2009 to 72 this past season. Progress people, progress. Apparently, this means the time to strike is now. After they pulled off a "blockbuster" trade with the Los Angeles Angels picking up Ervin Santana as well as signing Jeremy Guthrie to a three year $25MM deal (That's one way to skew the market), rumors abound that the Royals are willing to part with uber-prospect Wil Myers in search of a frontline starting pitcher at the big league level. Baaaaaad call Mr. Moore, bad call. I guess Dayton thinks that 21 year olds who turn AAA into their own personal batting practice grow on trees. 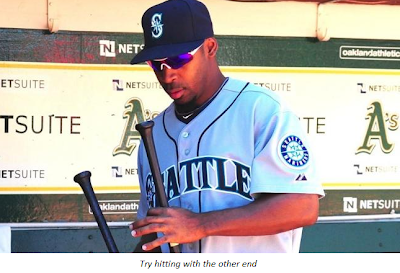 Looking back at 2009, you have to wonder just what happened to Chone Figgins. In Figgins contract and career year, he hit .298/.395/.393 with 42 stolen bases, led the AL in walks and played world class defense at third base. Figgins posted a 7.5 rWAR (Baseball-Reference wins above replacement) that trailed only Joe Mauer (7.6), Chase Utley (8.0), Ben Zobrist (8.3) and Albert Pujols (9.4). But then the clock struck midnight on his Angels career and he signed a multi-year deal with the Mariners. Not only did Figgins turn into a pumpkin but the neighborhood kids came by and kicked in his face. The Mariners signed Figgins for four-years, $36 million and moved him from third (where he had just finished in the ranks of Evan Longoria and Adrian Beltre in UZR) to second. 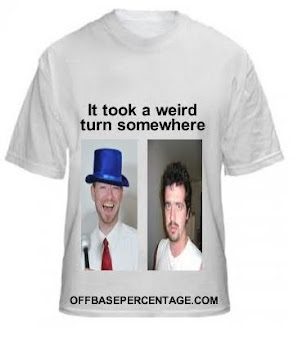 Side note: In the 2001, Baseball Prospectus raised the question concerning Figgins, "How many guys move off of shortstop and do even worse at second base?" From there, the Mariners moved Figgins back to third base in 2011 to left field, center field, third base and the bench in 2012 to the unemployment line in 2013. The M's will pay Figgins his remaining $8 million to not play with them. Not even on MLB the Show for PS3. Figgins was bad in 2011-2012. Really bad. Like .188/.241/.243 in 2011 and .181/.262/.271 in 2012 bad. Seatlle hasn't seen a career end that poorly since Kurt Cobain. But was Figgins the worst player in baseball over the 2011 and 2012 seasons? Not quite. According to Baseball-Reference WAR, the worst position player the last two seasons was your 2009 NL Rookie of the Year, Chris Coghlan. You'll always have that fourth place finish in '09, Andrew McCutchen. Considering recent events, it's almost fitting for the Marlins have two players on this list. I suppose a case could be made for any of those guys to be considered the worst because when you're talking about tenths of a win, it's just a tossup. Figgins definitely was hanging out on the wrong tier of the baseball hierarchy when it came to performance but he was in a different class when it came to cash. Figgins pocketed $19 million between 2011 and 2012. Coghlan, Joe Mather, Greg Dobbs, Tsuyoshi Nishioka and Wilson Valdez combined to make $11.46 million over those two years with Nishioka's $6 million preventing Figgins from lapping the group. Final tally: Mariners paid Figgins $36 million over four years. Figgins produced negative $4.5 million (according to Fangraphs) over four years. Of course, that number is inflated by Figgins not playing for the Mariners in 2013. In the span of a week, the Cubs went from being smart to peculiar. Which isn't all that surprising. After all, this is the Cubs we are talking about. Last week the cubs swooped in with I'm tentatively calling the signing of the offseason when they inked Scott Baker to a one-year deal. 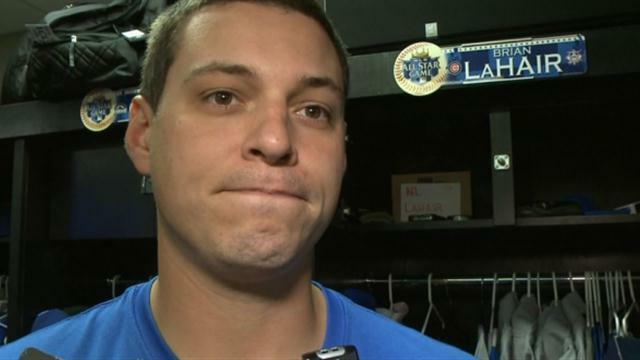 Yesterday they DFA'd 2012 All Star, and killer of my fantasy team, Bryan LaHair. According to the Chicago Tribune, the move is a precursor to sending him to Japan. The green stuff is wasabi, you've been warned. You know that moment when you feel like you've been kicked in the stomach? Nothing actually touches you, but all the air just escapes your body. Yeah, the MVP voting in the AL felt just like that. At least most of the voting went as it should in the Junior Circuit, well almost most. "I just listened to Mike Eruzione, from the 1980 Olympic hockey team, talk about respecting the team, respecting the game and trusting each other," La Russa said. "Well, that's exactly where it starts, and when you find a teammate who really buys into that, that's when you put him in that tied-for-first category." Do you believe in teacher's pets? YES! A couple of weeks ago, the Chicago Cubs seemingly had a new starting pitcher in Dan Haren while simultaneously dumping the fantastically wild Carlos Marmol at the same time. Angels fans were all kinds of sad face, while Cubbies fans rejoiced. Then something weird happened. The Cubs pulled out. The Cubs. Pulled. Out. Maybe it was something in Danny boys medical record that scared them. Maybe they enjoy the "excitement" whenever Marmol is on the mound. For whatever reason, the trade died, leaving this blogger to believe that Theo Epstein was quite possibly losing his mind. One way or another, the Marlins sure do like the attention of the Hot Stove league. Last year, on a new tax-funded-stadium high, the Marlins bid on every big ticket free agent like their revenue sharing cash was about to expire. 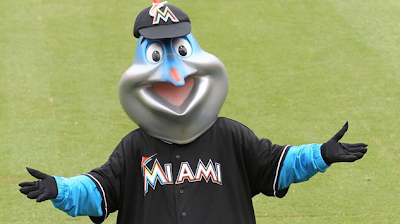 The Marlins will try a different, more Marlin-y approach to the off season this time around. After a less-than, shall we say, winning start to the new-look Fish, the Marlins traded Hanley Ramirez and Anibal Sanchez during the season. Monday, the Marlins inventoried the team and traded away everything else that wasn't nailed down except for poor Giancarlo Stanton. He just got to know Jose Reyes and Mark Buehrle, the two big names signed last winter. Almost an ace Josh Johnson, John Buck and Emelio Bonafacio plus $4 million are off to Toronto. Miami gets back 2012 Toronto top five prospects Jake Marisnick and Justin Nicolino, Single-A righty Anthony DeSclafani, noted homophobic-slur-eye-black-wearer Yunel Escobar, Henderson Alvarez and Jeff Mathis for some reason. The deal might work out okay for the Marlins in the long run IF the prospects advance. But try telling that to the fans who had playoff hopes a season ago and just witnessed the payroll drop from $101MM in 2012 to $20MM-ish in 2013. Or try telling that to your remaining Star/notable Major Leaguer/guy with a team hat, the hitter formally known as Mike Stanton. Woof. That did not go well. The Marlins should tell him about all of the top draft picks they're going to get before they trade him. That should calm him down. It can't be easy to play for a franchise that spent aggressive to win and abruptly gave up after one season. It would be hard to blame Stanton if he went malcontent, Hanley Ramirez-style all over the Marlins asses. I'm surprised the Marlins haven't tried to trade the new stadium to Oakland or Billy the Marlin to Captain D's. Looks like Melky Cabrera still might get a fat paycheck even though he got popped for elevated testosterone levels suggesting PED use. It is being reported that at least five teams have expressed interest in the outfielder. Why? I'm not sure. He still has an incredible arm, but if these teams are going after the Melkman for his bat, chances are they are going to be sorely disappointed. Melky's career slash line is .284/.338/.414, and that's with his .346/.390/.516 line from 2012. If you take out his inflated production from this past season (as it is almost certainly an outlier thanks to the drugs) his line comes down to .275/.327/.398. Zoinks. That's a .722 OPS. For comparison, Juan Uribe's career OPS is .715. And I highly doubt Uribe is high on any teams wishlist. It looks like money does grow on trees somewhere near Chavez Ravine. As if the Dodgers hadn't spent enough money over the last six months through trades, personnel additions and signing Cuban defectors to send Fort Knox into financial ruin, they felt it was necessary to pony up $25.7MM......just to talk. I guess the front office didn't get the memo that Verizon has plans starting at $30 a month. Of course, it's not like they are blowing it on just anything. The amount is the posting fee for Korean pitcher Hyun-Jin Ryu, giving the team 30 days to negotiate a contract with the 25 year old pitcher. To be fair to Ryu, he has been an absolute monster in the KBO. In 2006 he won the ROY and the MVP (the only member of the KBO to do so), has one Wins Title, two ERA Titles and five Strikeout Titles. He also led South Korea to the Gold Medal in the 2008 olympics and then in 2009 led South Korea to the championship game in the WBC. The Star Tribune posted a list, that was originally broadcasted by KFTP's Darren Wolfson, listing pitchers that are on the Minnesota Twins free agent wish list this winter. And I, your humble author, am going to safely assume that these pitchers put the Twins somewhere between the Royals and Astros on their list of hopeful destinations. Other than the five indoor water parks, the Mall of America and the "too happy for their own good" Canadian outcasts, I don't see many reasons why a player would sign with a team that can't get itself out of the AL Central's basement. If you chose to not click the link, the list is as follows: Anibal Sanchez, Ryan Dempster, Brandon McCarthy, Brett Myers and Brandon Webb. A painful tenure in New York ended for jason Bay on Wednesday as the New York Mets and Bay came to an agreement to expire his contract with one year and $16MM remaining on the deal. Bay, who has been a model of consistency in New York who has been a total and complete flop during this contract, is now an unrestricted free agent. Somewhere, Tony Reagins wishes he could sign him. 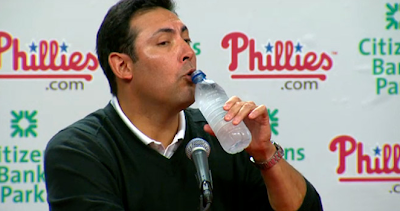 Phillies general manager Ruben Amaro Jr has been named in a lawsuit. Armed with just a street law degree, I found it interesting that Phillies fans could file a class action lawsuit against Amaro just because of the Ryan Howard extension and the Jonathan Papelbon contract. As it turns out, the lawsuit has little to do with Amaro's incompetence with a checkbook. The suit states that Modami initially got positive responses from the Nationals and Dodgers when he contacted them for a job in late 2011. But both teams eventually rejected Modami, the suit claims, because Amaro told both teams' general managers that he was no longer with the Phillies because he was stealing and selling memorabilia, the suit alleges. "Moreover, Amaro claimed that plaintiff Modami was writing negative things about the team on the Internet," according to the suit. I bought all of this Chase Utley game used memorabilia fair and square on ebay, you guys, from seller phllysbpptchr07. I suppose Modami will get his day in court to dispute the claims of him thieving the clubhouse. I'm more curious to see what negative things Modami was writing about the Phillies online. My money is on Facebook updates like "struck out ryan Howard in bp. their stupid if rupen amaro thinks hes worth that cash" and "i have the phanatics costume in my trunk, hit me up if u want to by it." A couple of weeks ago, news hit the interwebs (as well as some papers, as if anyone actually reads those things anymore) about Bobby Valentine calling out David Ortiz for quitting on the team down the stretch because of pain in his heel. 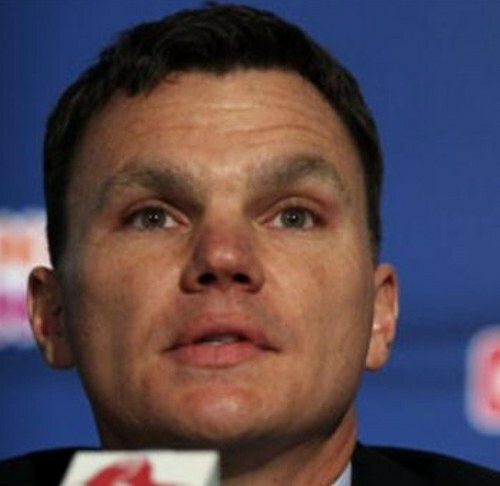 One of Bobby's supporters coming into September was Red Sox General Manager Ben Cherington. A couple of weeks ago (yes I am a procrastinator, why do you ask?) I asked our special guest if he would be willing to chat with me about the Red Sox 2012, Bobby vs. Oritz and clam chowder. Since I bring a pleasant mix of......something, he happily agreed and gave me insight that only a GM's brain could supply. GM Cherington, you are now on the clock. Labels: Boston Red Sox, Clam Chowder, Uh, Who's your daddy? 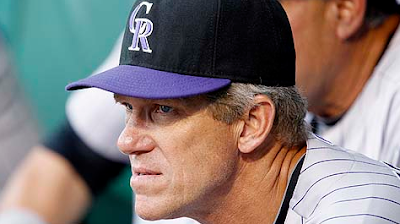 The Colorado Rockies have narrowed their search for a new manager down to four finalists. The position became available when Jim Tracy resigned on October 7, 2012. Tracy took over the job in 2009, leading the Rockies to the playoffs and winning NL Manager of the Year. Tracy, perhaps tactically impaired, followed up his Rockie debut with a wild card collapse in 2010 losing 13 of his final 14, a 73-89 2011 record, an oddly timed lifetime-ish contract extension and then a franchise worst 64-98 record in 2012. I'm sure Tracy was disappointed to hear about his resignation. With the Tracy era in the rear view, the Rockies are set to choose their next skipper. Here's a brief look at the candidates. Why I'd hire him: For spring training 1992, Runnells showed up dressed in marine fatigues so he's clearly a bit of a crazy person. He has professional experience and eight major league career hits. Why I'd pass on him: He has the lingering stench of Tracy on him. His wife is the lead news anchor for the CBS affiliate in Toldeo, Ohio. CBS airs Two and a Half Men. Why I'd hire him: He is a five time All Star and World Series champion with a connection for large quantities of HGH. Williams is a hard worker and is actively paying his dues to be a major league manager. He's listed on a famous document with some of baseball's best players. Why I'd pass on him: He is a partial owner of the division rival Diamondbacks. He's listed on a famous document with some of baseball's best players. Why I'd hire him: He has 429 career home runs, 47.6 rWAR, five All Star appearances and an MVP. His brother is Jeremy Giambi. He's listed on a famous document with some of baseball's best players. He actually had 113 plate appearances for the Rockies in 2012 so he knows where everything is already. Why I'd pass on him: After years of playing simulation games, I have way more experience managing than Giambi. He'd face awkward moments with current players/former teammates after having to tell Michael Cuddyer he isn't very good and Todd Helton he's old. He's listed on a famous document with some of baseball's best players. Why I'd hire him: His name is Walter William Weiss and alliteration is fun. He is a World Series champion and won AL Rookie of the Year in 1988. Why I'd pass on him: The 1988 rookie class was extremely weak and my Walt Weiss rookie card never appreciated in value. Also, maybe something about lack of pro experience.